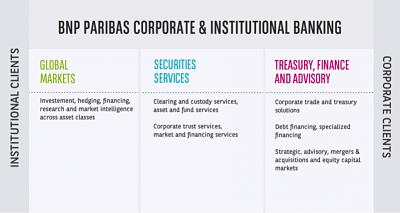 BNP Paribas Corporate & Institutional Banking (CIB) is a global provider of financial solutions to corporate and institutional clients. With almost 30,000 people in 57 countries across EMEA (Europe, Middle East and Africa), Asia-Pacific and the Americas, we offer solutions tailored to all our clients across capital markets, securities services, financing, treasury and financial advisory. A globally-recognised leader across multiple disciplines, our areas of expertise include structured financing, derivatives and risk management, among others. Acting as a bridge between its two client franchises, it aims to connect the financing needs of corporate clients with the investment needs of institutional investors. Working in partnership with our clients, we help provide a full range of solutions to meet their ongoing needs, including liquidity management (cash management, trade finance, forex) and structured finance. 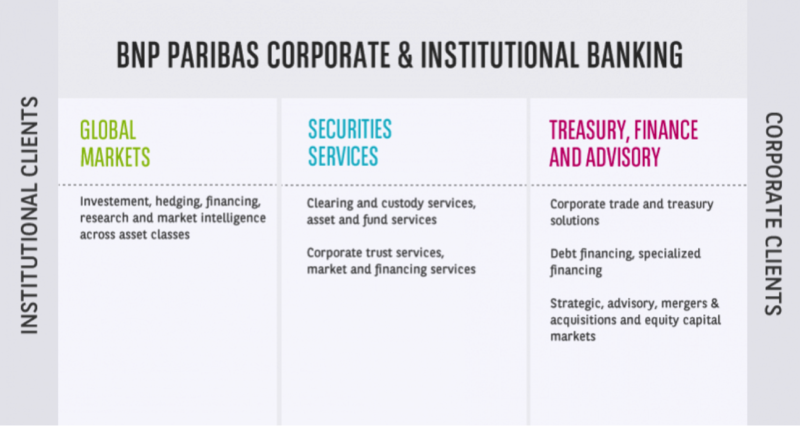 By linking financing needs and investment opportunities, our specialists act as a bridge between corporate and institutional clients. All the while following a stringent risk management policy that ensures we conform to industry regulations. With the onset of the digital economy, we are taking the lead to embed digital transformation at the heart of BNP Paribas CIB’s strategy. We work in partnership with our clients, always aiming to encourage innovation – for instance, by organising hackathons to establish and promote a digital culture. Our digital strategy is built on three pillars: Big Data, Blockchain and Artificial Intelligence. Drawing upon recognised expertise in new technologies, we aim to offer clients integrated, powerful platforms for a seamless user experience. Centric is a new way to put your organisation’s cash to use – going beyond managing risk and optimising liquidity, and helping you to make your underlying business stronger. A corporate-focused platform that offers treasurers the ability to manage all their business operations on a single platform, it is a seamless multi-product, application-based service, configured not only to optimise efficiency, but to help corporate treasurers do business. At BNP Paribas CIB we are committed to harnessing our innovative approach to work in a sustainable and socially responsible way. In the fight against climate change, we work in close partnership with our clients to understand both the challenges and the opportunities: we offer a range of green financing solutions while helping them adapt to the evolving regulatory framework. We have played an especially active role in the development of the green bond market and have in-depth knowledge of, for example, the renewable energy market and water consumption reduction. By the end of December 2015, BNP Paribas’ activities in financing and advising on renewable energy projects amounted to more than €7.2 billion. We aim to reach €15 billion in 2020. The carbon footprint associated with our investment portfolios is measured and communicated to our clients in an open and transparent manner.